Folder Transfer is the best software program to transfer big files and folders over Internet / Intranet. You can use this automatic network file transfer program to remotely transfer files to multiple destinataions at a time. No matter your file size is 2GB or over 3GB, Folder Transfer will allow you to transfer unlimited big files to any computers over the Internet directly. You don't need to transfer big size files to a third-party cloud storage service provider. Also unlike Dropbox which only allows maximum 2gb storage space for each user, any Folder Transfer can transfer unlimted size of files over internet. Please download Folder Transfer to send large files between computers across internet. Transfer big files between two computers over Internet or Intranet. What benefits will you get from this big file transfer software ? transfering files and folders to a remote computer over Internet usually brings you headache because you don't know the remote computer's IP address. (As explanation above, email attachment is not a good option for transfering bigger files and folders, you have to find an remote file transfer tool) Folder transfer provides you with the easist way to tranfer files between computers over Internet or any WAN :Intranet, VPN. With the flexible remote internet connection method, you don't need to know the remote computer's internet IP address on the internet and its port number. 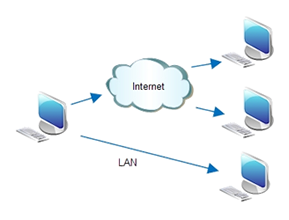 all the computers can connect together by signing in a same network group, then they can transfer files between the network group members. Definitely, you can also input the remote computer's internet IP and port number to set up the remtoe network connection, then remotely transfer files between computers via internet. The software cannot only used for remote file transfer, but also for local network computer file transferring. No matter you wish to implement a file transfer from laptop to desktop, or movefiles from desktop to laptop, Folder Transfer is the best way to copy files computer to computer. Particularly, when some members in the same team need transfer big amout of files between laptops because they are doing a same project, and these files and folders are 100 MB or less, and then you can use Folder Transfer, which is a file transfer freeware to help you transfer files from one laptop to another laptop. (You need order a pro or enterprise edition online for transfering files over 100 MB) It is recommened to use the Enterprise version because you can remotely transfer big files over internet no matter the file size is over 1gb or 3gb. If you are a salesperson in your company and need get many new materials from your manager's desktops, all the files are in a same folder and are synchronized every week, what is the best way to copy files from computer to laptop ? Try Folder Transfer ! You just need to drag and drop the folder into the program window, and select the destination computers you wish to transfer, all files will be sent automatically. Folder Transfer is the best free program for file transfer between two computers, especially for transfering a large folder. Folder Transfer program is not only an internt file transferer software, but also a lan file copy software. As a marketing or sales person, you may need often copy many files and folders from company's server or your desktop to show some key materials of your company's products and services. So you will have such questions at your company, how can I do a computer to computer file transfer? More exactly, how to move my tons of files from desktop to laptop ? If i am out of office, how can I retrieve files or data from my company's server over internet remotely? What is the best way to copy files and folders between computers, especially when there many files that are big size need to copy or move ? Definitely, Folder Transfer is the best pc to pc file transfer utitlity for you to transfer your files between two computers. In addition, it is an automatic file transfer software program, you just need to drag the files and folders into the program window, then you can transfer all of the files to another pc. Have the largest files to transfer ? Try Folder Transfer that is the best free software for large file transfer between computers over Internet.